The Hampsher Hotel in Forrest, IL is located on the extreme east end of Forrest’s business section’s main street and is a landmark lodging facility that has been renovated and refurbished using some very unique ideas and expertise. A long standing icon of the town’s history the hotel was originally established to service clientele from the nearby railroad facilities, both passengers and train crews, but, in time, what was once a thriving hub for that source of traffic became non-existent and the hotel fell into disarray. That situation has been rectified by an energetic group of history preserving investors who have brought the structure back to life and turned it into an appealing facility for today’s style of appreciation while preserving it’s connection to the past. The old Forrest Hotel is now the new Hampsher Hotel and it is virtually a work of art. The building has undergone a complete transformation, inside and out, and now presents a very appealing presence that has a clean, bright, and well appointed appearance while maintaining the character of its age and history. At the entry level, on the main floor, there is a nifty little gift shop, two comfortable and spacious dining rooms, and the kitchen. The lodging rooms are located on the second floor and are accessible by a stairway just inside the front doors – there is a mechanized lift chair for those folks who need assistance in negotiating the second level. The hotel operates with a “Bed and Breakfast” concept and there are four separate rooms available for guest accommodations. Each of these rooms has their own individual theme with a décor to match that is eye catching, intriguing, and comfortable. The rooms vary in size and there is a variety of arrangements from whirlpool baths to multiple beds and sitting rooms all of which are in a “user friendly” environment. There is also a “meet and dine” banquet facility in the basement that is available for gatherings (it can be for just “meet” if that’s all that’s needed) which has been done up with an outside garden décor and, appropriately named, “The Garden Room”. There is a spacious capacity that can accommodate larger groups and its the perfect place for any meeting agenda, comfortable with a relaxing visual presentation and dining accessibility. 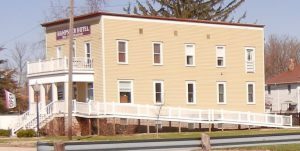 All in all, the Hamsher Hotel is a self contained lodging and meeting facility with amenities to match and it will provide a pleasant experience for guests and groups who are fortunate enough to give it a try. A special nod to the Forrest Historical Society and all of those who have contributed to the rescue of one of the town’s historical monuments. If you’re there and get into the history of the place you may hear a story about monkeys running around the building – that is actually true because the original owner (way back before our time) had pet monkeys that kind of wandered around once in awhile. That could be a bit of shock to wake up in your second floor room and see one of them looking in the window but, not to worry, they are long gone, safely encased in the Hotel’s history of yesteryear. So, when you get those visiting relatives or friends you’ve got a really nice place you can stash them for the night or, if maybe you just want to take a break from the rigors of everyday house life you’ve got a nice little get away that can ease the load. Go ahead, pamper the in-laws or give yourself a treat and get a room at the Hampsher where you can spend a night in comfort while their staff does the heavy lifting. And, don’t forget, family reunions, business meetings, or a get together for any reason can be enjoyed in the Hamsher’s Garden Room – its all there, just waiting for you.